All prices shown are Retail Prices and INCLUDE 10% GST. For wholesale prices please contact David & Sarah directly. 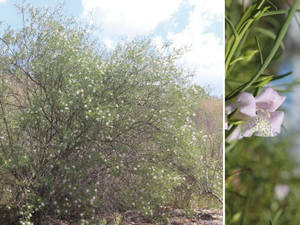 Myall - A hardy slow growing shade tree to 18 m - grey weeping foliage - cream flrs in Wi - tolerant of poorly drained soils - long lived - frost and drought resistant. 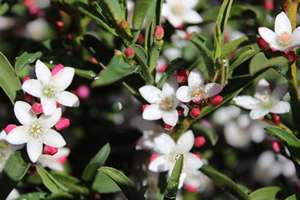 A hardy open shrub reaching 2 m in height - fine dark green leaves on pendulous branches - showy with tiny white flrs during Sp - tolerant of frost & poor drainage. 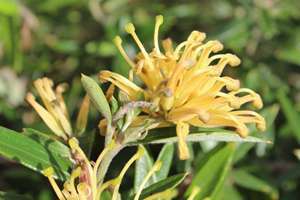 Spreading shrub to 1.5 m - large dark green leaves with silver undersides - large yellow flrs in Au and Wi - frost hardy. 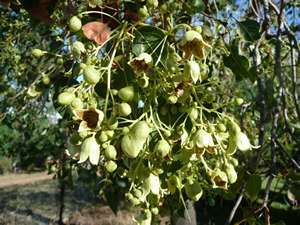 Kurrajong - small bushy tree to 12m - useful fodder and shade tree for dry areas - suitable windbreak around cultivation - creamy bells in Sp followed by large boat shaped pods in Su - frost tender when young but generally very hardy. 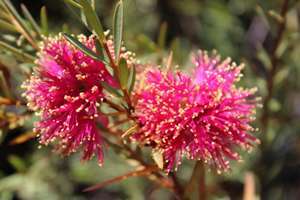 Fast growing shrub to 1.5 m - narrow foliage - bright pink brushes 3x a year - frost resistant. 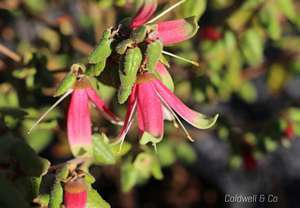 Shrub to 3m - stiff dark green foliage with pink new growth - large crimson brushes in Sp & Au - usually frost resistant. 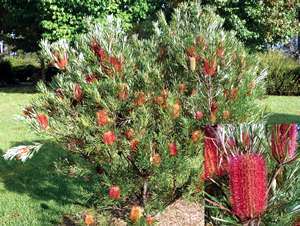 A hardy rounded shrub to 1.5m high - bright green foliage - dense red brushes with a pink hue during Sp - tolerant of frost & clay soils. 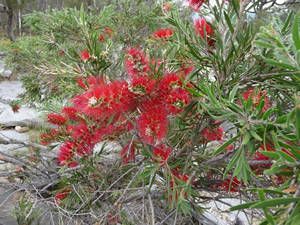 Ground cover with a 2.5m spread - green oval but pointed leaves - large red bottlebrushes late Sp - Su - frost hardy. 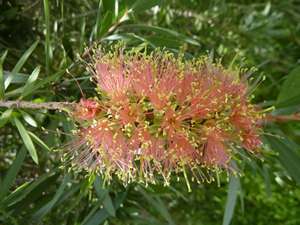 A dwarf compact form of Callistemon growing 0.5 m x 1 m - lush green foliage - bright red bottlebrushes in Sp - makes a showy border - tolerant of moderate frost. 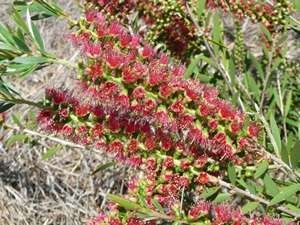 Distinctive squat growing shrub to 1.5 m tall - attractive broad leaves with bronze new growth - clusters of red brushes with gold anthers appear in Sp - light frost only. 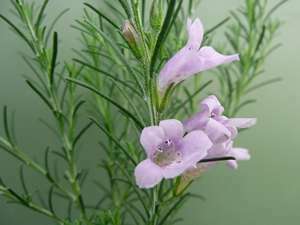 Semi-weeping shrub to 3 m tall - narrow green leaves - flushes of pale pink brushes several times during the warmer months - hardy in heavy sometimes waterlogged soils - frost resistant. 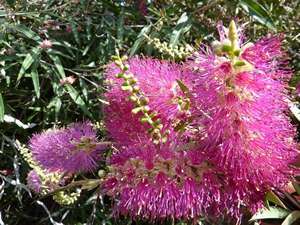 Shrub to 2 m tall - green foliage - purplish pink brushes during Sp - frost resistant. 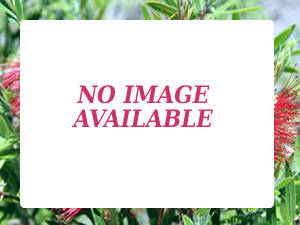 Stiff upright bush to 3 m - tough pointed grey green leaves contrasting with the large delicate 2 tone pink brushes in Sp - frost and drought resistant. 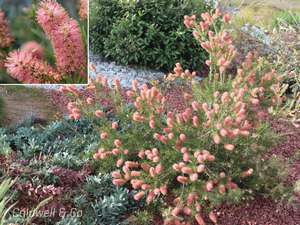 Upright shrub to 3 m tall x 2 m wide - attractive grey green foliage - pink brushes in flushes throughout the year - frost resistant. 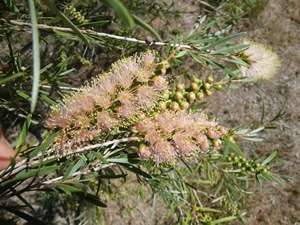 Alpine Bottlebrush - shrub growing to 1.5 m tall - very small green leaves - short pink brushes with yellow anthers occur in Sp - tolerant of frost & wet conditions. 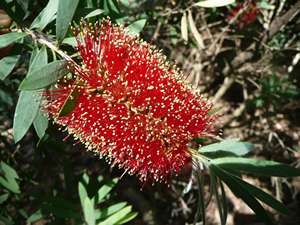 Spreading shrub to 1m tall - broad green leaves - deep red bottlebrushes with yellow anthers in Su - moderate frost only. (syn. 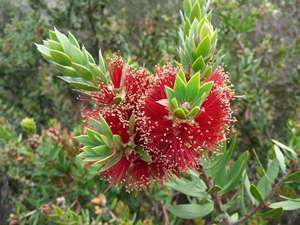 C. pearsonii) - open lowgrowing bottlebrush to 30 cm high - small narrow semi-prickly leaves - showy bright red brushes with yellow anthers during Sp - frost resistant. 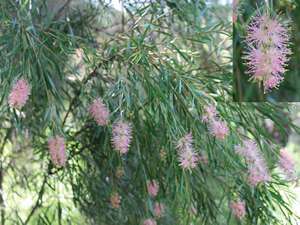 This 3 m tall shrub originated in the Stanthorpe district - the grey/green foliage is particularly fine & weeping - small pale pink brushes during Sp - tolerant of heavy frost & poorly drained soil. 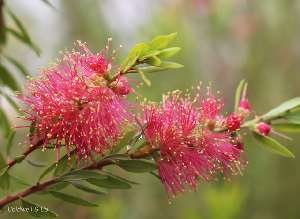 Grows into a dense 3 m tall shrub - green foliage with colourful pink new growth - clusters of bright pink bottlebrushes in Sp - tolerant of light frost. 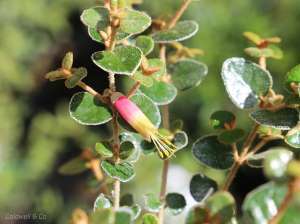 A dense shrub reaching 2 m - narrow green foliage which will form a hedge if pruned in Nov. & Feb. - flr clusters produced in Sp change from deep red to rose colour as the flr matures - frost tender when young. 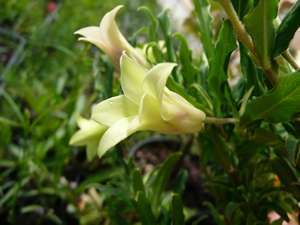 White correa - shrub to 1m - soft round grey leaves from which tea may be made - white star like flrs in Sp - frost resistant. 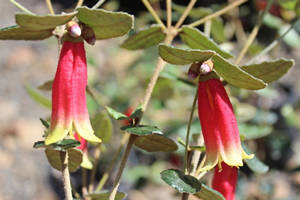 Compact shrub to 1 m high - bright green foliage - masses of large orange/red bells in Au - frost tolerant. (syn. 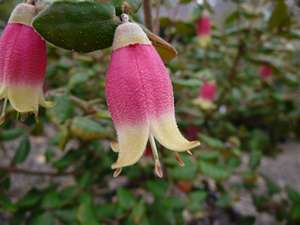 C. New Year) - upright shrub to 1.5 m tall - dark green felted oval leaves - this shrub is showy with green tipped red bells during the Au months - tolerant of frost. 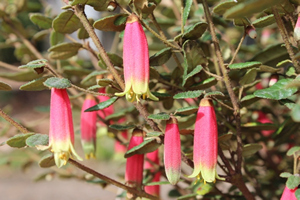 Shrub reaching 1.5 m tall - round furry aromatic leaves - fat showy bright pink bells with lemon yellow tips from January till June - frost resistant. 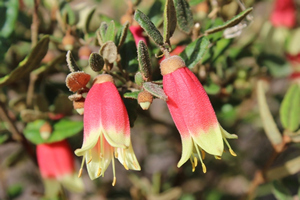 This compact spreading shrub grows to 1m tall - green furry heart shaped leaves - the unusual red flowers have a split corolla with apple green tips - tolerant of frost. 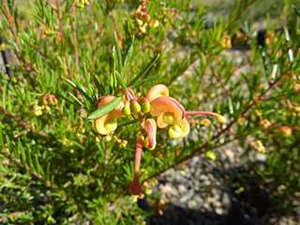 shrub to 80 cm tall - soft green aromatic foliage - large red & yellow bells in Au & Wi - frost tolerant. 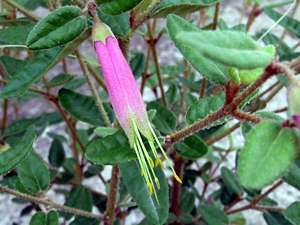 Spreading shrub to 0.4 m tall x 2 m across - green aromatic leaves - large pink bells with cream reflexed petals occur in Au & Wi - frost hardy. 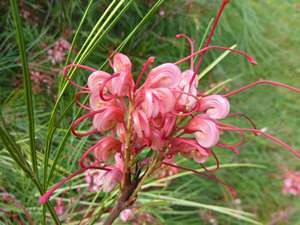 A compact rounded shub growing to 1m high - neat oval green leaves - shell pink tubular bells in Au & Wi - hardy in a variety of soils - frost resistant. 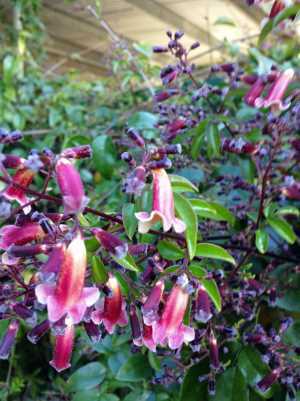 Neat compact shrub reaching 1 m high - glossy dark green rounded leaves with prominent oil glands - large red bells in Wi - frost resistant. 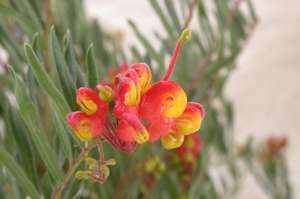 Upright open plant to 0.8m tall - furry heart-shaped leaves - showy rich red bells with yellow tips occur in Au - tolerant of frost & part shade. 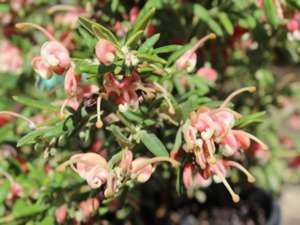 Spreading shrub growing 0.3 m x 0.6 m - tiny linear grey green leaves - red, yellow & green flrs are produced from Sp to Su - prefers moist sandy soil - frost tolerant. 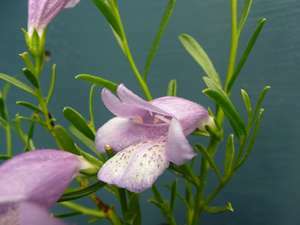 Low mat forming flax lily to 20 cm tall - smooth pale green leaves - short stems of blue flrs - frost tolerance unknown. 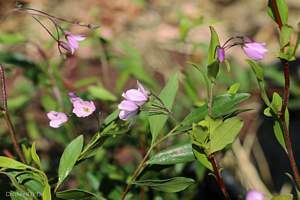 Hardy shrub for a dry spot reaching 4m high - long narrow leaves - prolific large mauve tubular flrs much of the year - tolerant of frost and heavy soils. 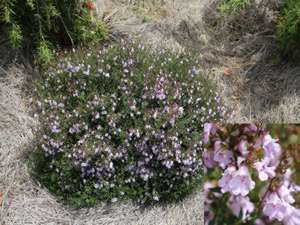 A neat groundcover with olive green oval leaves - dark red tubular flrs for most of the year - frost & drought resistant. 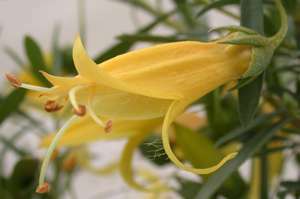 Spreading shrub to 1.5 m high by 2 m wide - narrow dark green leaves - clear yellow tubular flrs over a long period - frost resistant. 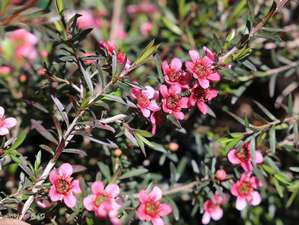 Shrub to 1 m - spotted cerise tubular flrs much of the year - tolerates drought, lime and frosts. 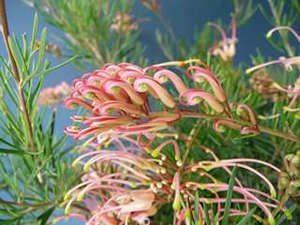 Hardy plant to 1.5 m - pale green foliage - yellow buds followed by pale pink tubular flrs - frost & drought resistant. 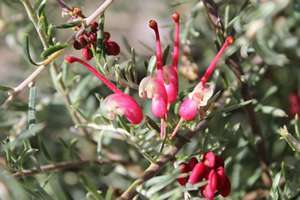 A hardy shrub to 2 m which responds well to pruning - soft dark green leaves - pinkish red tubular flrs with spotted throats are borne throughout most of the year - frost & drought resistant. Piccaninny Dawn - Upright compact shrub to 3m - narrow dark grey leaves to 3m - showy rose pink tubular flrs in Wi & Sp - frost tolerant. 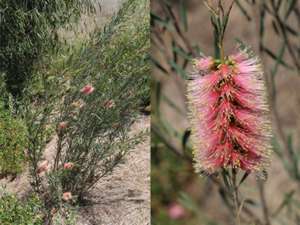 An erect plant to 2 m tall & 1 m wide - upright stems of soft grey foliage - the reddish pink tubular flrs occur during Wi & Sp - frost & drought tolerant. 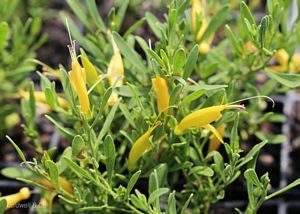 Rounded shrub to 1 m high x 60 cm wide - green lanceolate leaves - yellow & red pea flrs in Sp - frost resistant. 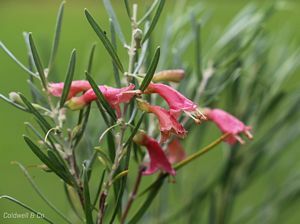 Upright shrub to 3 m tall - attractive glossy green foliage - bright red tubular flrs in Su - prefers shade - frost tender. 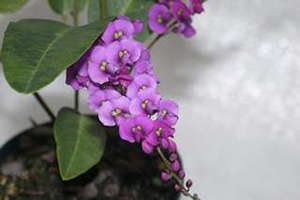 Bushy shrub to 1.5 m - small linear pointed leaves - mauve flr clusters much of the year - frost resistant. 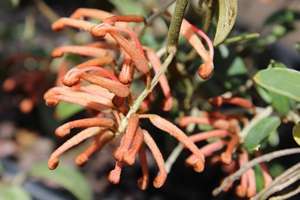 Fern Leaf Grevillea - a hardy species reaching up to 5 m tall though usually less with pruning - long dark green leaves - purplish pink toothbrushes occur in Wi & Sp - frost tolerant. 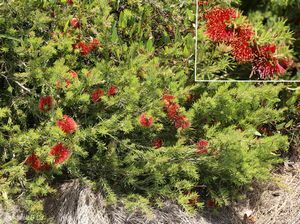 A spreading compact shrub which grows to 60 cm tall by 1 m across - small linear green leaves - showy bunches of waxy red & gold flrs in Sp, Su & Au - full sun or part shade - frost resistant. 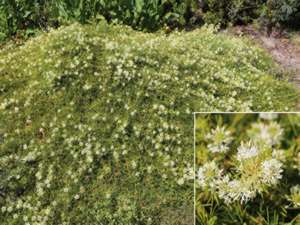 Fast growing screening shrub to 2 m tall by 3 m wide - light green fern like leaves - burgundy toothbrush flrs occur throughout the year - tolerates frost & wind. 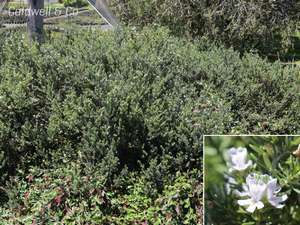 Vigorous ground cover - fine prickly lime green leaves - small scented white flrs in Sp - usually frost resistant. 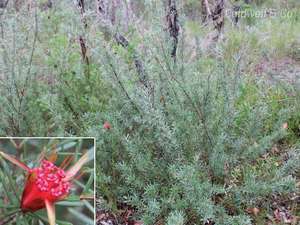 Vigorous groundcover spreading to 3 m - attractive green pinnate leaves - prolific bright red toothbrush flrs in Sp - frost tolerance unknown. Compact rounded shrub to 1 m - narrow linear green leaves - unusual red, brown and yellow flr clusters during Wi to late Su - frost resistant. A prostrate & less vigorous form of G. molongolo - variegated foliage - apricot coloured flrs in Wi & Sp followed by striped seed pods - frost tolerant. 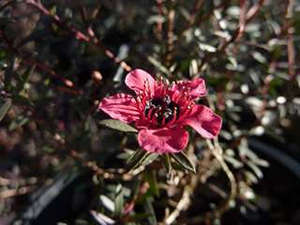 An open shrub to 1 m tall - striking grey foliage - fiery red spider flrs in Sp - frost resistant. 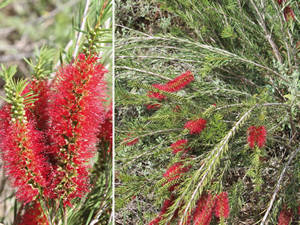 Rounded shrub to 1 m tall - small linear green leaves - good display of showy red & white flrs in Sp - frost resistant. 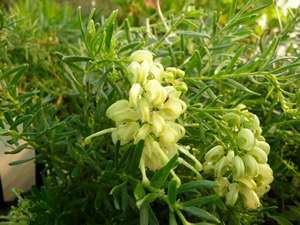 Vigorous bushy shrub to 2 m tall - attractive long deeply lobed leaves - apricot toothbrush flrs during Wi & Sp - tolerant of light frosts only. 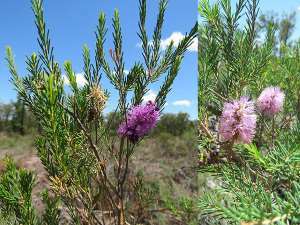 Hardy bushy shrub to 2 m tall - deep green leaves with toothed margins - eye-catching pinkish purple toothbrush flrs in Wi & Sp - frost resistant. 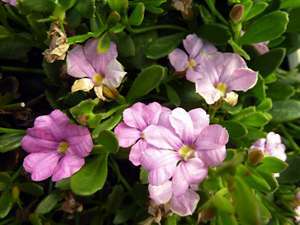 Vigorous & hardy twining creeper - green heart shaped leaves - small panicles of violet pea flrs in Sp - moderately frost hardy. 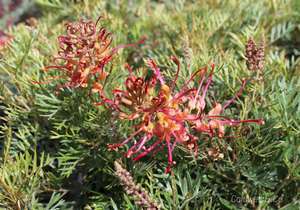 Mountain Devil - upright vigorous shrub to 2m - reddish pointed narrow leaves - dark pink grevillea like flrs much of the year leading to unusual pods - moderate frosts only - needs good drainage. 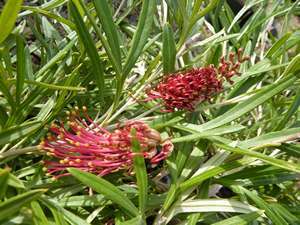 Dwarf tea-tree to 1 m tall - burgundy foliage - single red flrs in Wi & Sp - frost hardy. 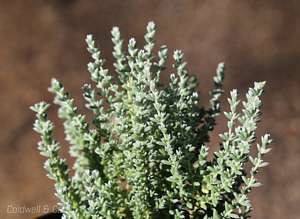 Hardy shrub with a conical shape - outstanding soft silver foliage on upright stems - tolerant of frost, heat & drought - attractive hedging plant. 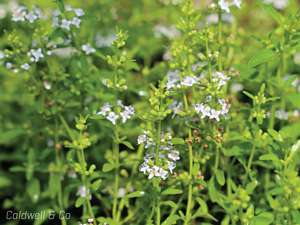 Neat totally flat ground cover - small purplish leaves - white spotted flrs Sp-Su - frost resistant - tolerates wet conditions. 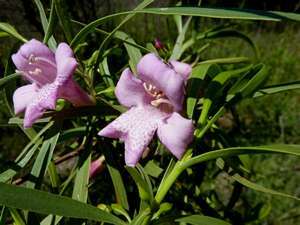 Vigorous twiner which can cover a 2 m tall fence � dark green pinnate leaves � masses of deep red trumpet shaped flrs with white throats are produced in Sp � light frost only. 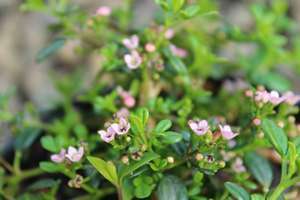 Compact hardy shrub to 1 m - aromatic green foliage - pink buds opening to wh. star-shaped flrs during Wi & Sp - frost resistant. 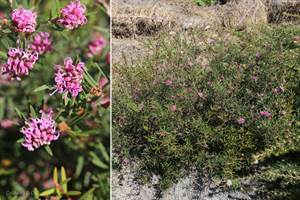 Native Wax Flower - shrub to 1.5 m - aromatic green leaves - pink buds and white starry flrs in Wi and Sp - tolerant of frost, lime and partial shade. 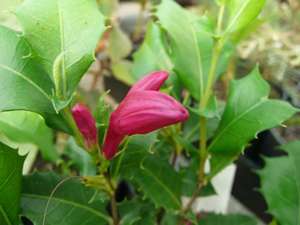 Hardy shrub to 1.5 m tall - small green aromatic leaves - pink buds followed by starry wh. flrs in Sp - frost resistant. 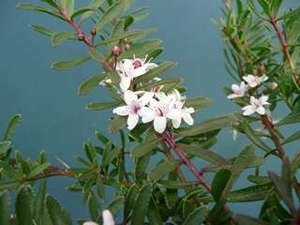 Neat rounded shrub to 80 cm high - aromatic green foliage - pink buds open to white waxy flowers in late Wi - frost resistant. 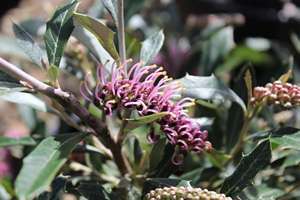 While this vigorous shrub will grow to only 1 m tall, it will reach 3 m in width - small dark green leaves - mauve flrs with purple spotted throat during Sp - tolerates filtered sun - frost resistant. 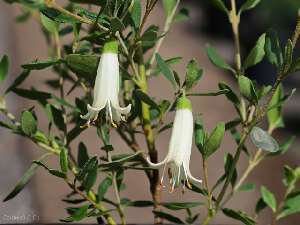 An unusual shrub reaching 1 m tall - green foliage without a strong mint bush scent - translucent green tubular flrs in Sp & Su - frost resistant. 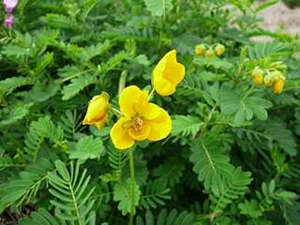 Spreading shrub to 1 m high - green pinnate foliage - yellow cassia like flrs from Sp to Au - moderate frost tolerance. 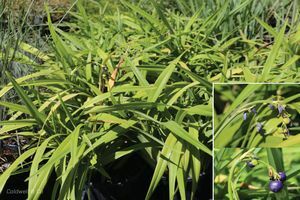 A small compact form of this hardy lily reaching 0.5 m high - grey green sheathing leaves - bright blue flrs with yellow anthers are produced in Sp - tolerant of frost & some shade. 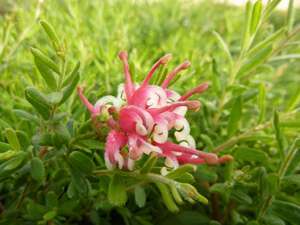 Hardy shrub to 2m - fine linear leaves - white flrs during most of the year - frost & drought resistant. 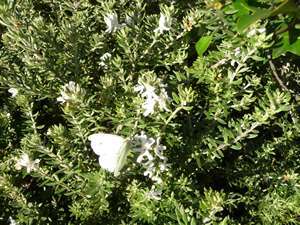 A variegated form of W. fruticosa growing to 0.5 m - silky grey leaves edged with white giving smoky appearance - white flrs - frost resistant. 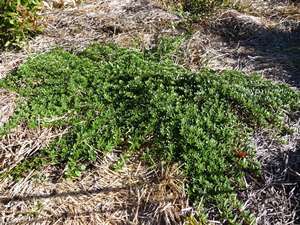 A compact prostrate plant spreading 50 cm wide - trifoliate glossy green aromatic leaves - small starlike pink flrs during Sp - moderately frost resistant. 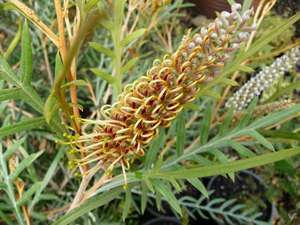 Red Swamp Banksia - one of the easiest banksias to grow, it forms a dense shrub to 3 m - narrow dark green serrated leaves - bears ruby red cylindrical flr spikes during Au - frost resistant. 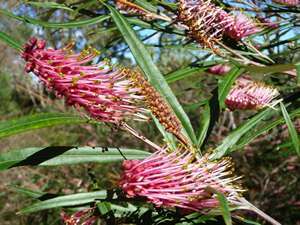 Big bushy shrub to 4 m high - long linear & finely divided dark green leaves - large erect spikes of waxy pink flrs occur Wi - Su - tolerant of drought & medium frost. 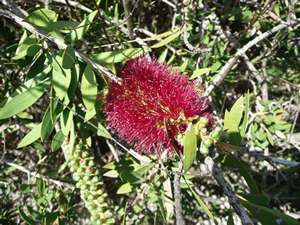 Dense shrub to 2 m - green prickly needle like foliage - prolific scarlet flrs in Wi and Sp - frost resistant. 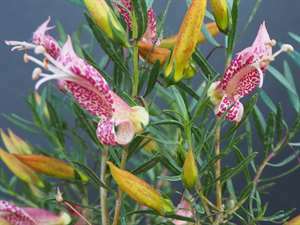 Grows to 1m x 1m - stiff divided leaves - large spikes of pink & orange flrs during the warmer months - useful as a low maintenance informal hedge - light frost only. 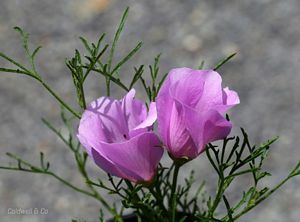 An open fast growing shrub to 2 m - succulent lime green divided leaves - showy 8 cm long pink hibiscus like flrs during the warmer months - dry sunny position - frost tender. 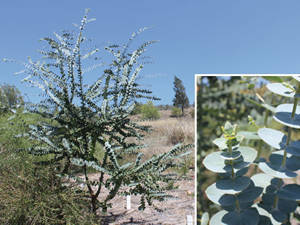 Hardy tree or shrub to 10m - large leaves, dark green above and silver below - yellow flr spikes Au and Wi - frost resistant. Apple Berry - a light weight twiner or ground cover - elliptical hairy green leaves with wavy edges - greenish cream tubular flrs ooccur thoughout the year - frost tolerant. 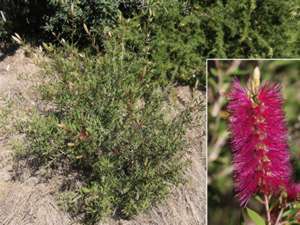 Bushy selected seedling of C. "Reeves Pink" growing to 2 m - dark green leaves - deep burgundy red brushes with gold anthers in Sp & Su - frost resistant. 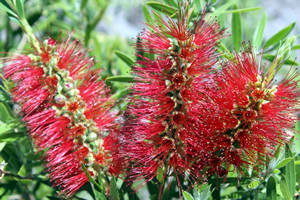 Hardy shrub to 3 m tall - pointed green leaves - showy plum red brushes in Sp - tolerant of frost & water logging. 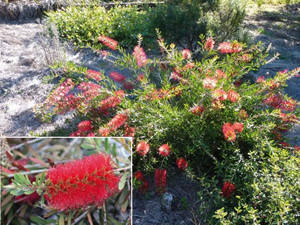 Compact shrub to 1m - green grey foliage - bright red brushes throughout the year - good tub specimen - light frosts only. 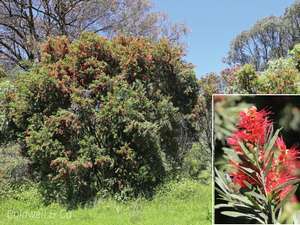 Dense hardy shrub to 2.5 m tall - weeping branches of soft green foliage - cardinal red bottlebrushes from Sp till Au - moderate frost tolerance only. 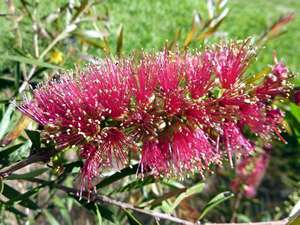 Useful bottlebrush growing to only 1.5 m tall - narrow green foliage - short green flower spikes during Sp - tolerates poor drainage & frost. 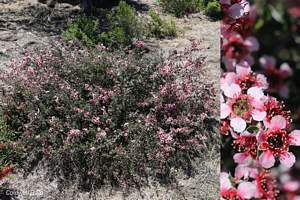 A compact shrub to 3 m - arching branches of narrow leaves - abundant small deep red flrs during Sp - tolerates frost & wet conditions. 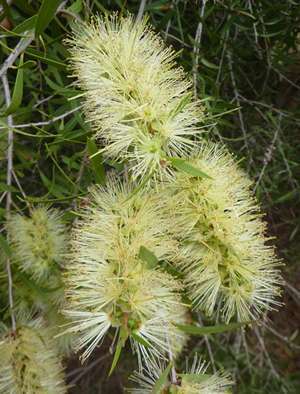 A ground covering bottlebrush reaching 60 cm high x 2.5 m across - dull green foliage with soft silvery new growth - lemon yellow flrs in Sp & Au - frost resistant. 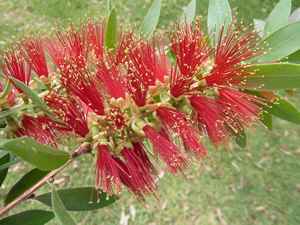 Bushy shrub to 2 m - small stiff leaves with bronze new tips - red bottlebrush flrs with yellow anthers in Sp - frost resistant. 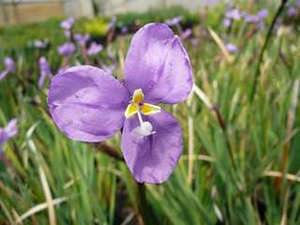 Hardy shrub to 3 m - broad dark green leaves with silvery new growth - 6cm long purple brushes in Sp - frost resistant. 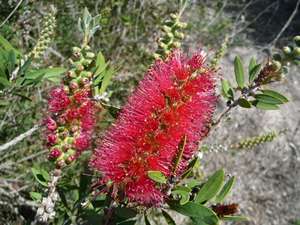 Shrub to 3 m tall - lanceolate citrinus like leaves - bears clusters of red bottle brushes near the ends of the branches in Sp & Su - frost resistant. 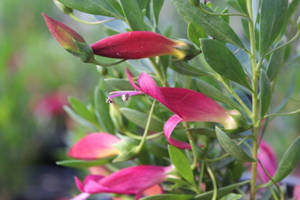 Hardy shrub to 5m - weeping blue/green foliage with pink new growth - bright red brushes in Sp - frost tender when young. 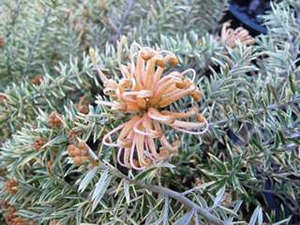 Shrub to 2m - soft green weeping foliage - spectacular display of orange/red flrs in Sp - moderate frosts only. 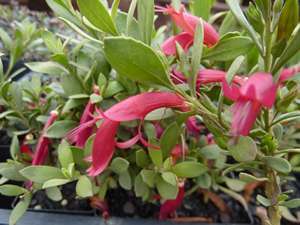 Shrub to 4m - stiff green foliage - very large mauve red brushes - frost resistant. 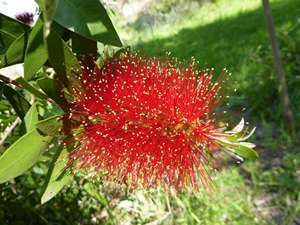 Net Bush - shrub to 3 m - upright branch spikes of downy grey foliage - brilliant red one-sided bottlebrush flrs in Sp - frost resistant. 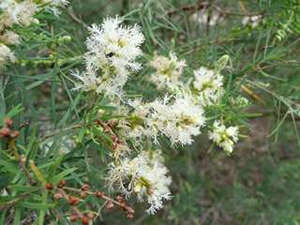 Fast growing bushy shrub to 2 m - glossy green mint like leaves - clusters of blue flrs in Sp - frost resistant..
Yellow Buttons - prostrate suckering herb 15 cm high x 1 m wide - soft silvery grey foliage - clusters of small yellow flrs occur in Sp & Su - frost & drought tolerant. 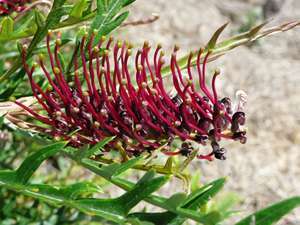 Low spreading shrub reaching 30 cm high x 2 m wide - dark green oval leaves - erect tubular red flrs with yellow tips most of the year - sun or part shade - frost resistant. 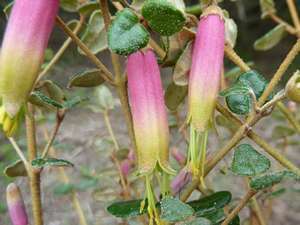 Spreading easy care shrub growing 1.5 m x 2.5 m - aromatic ovate green leaves - narrow red & green bell flowers occur Su till Wi - tolerant of drought & frost. 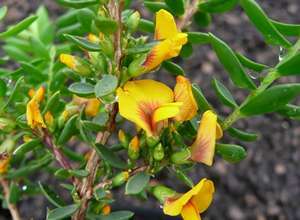 this hardy compact shrub grows to 1m tall - small dark green leaves - massed tubular red flowers with yellow/green tips occur much of the year - tolerant of frost. 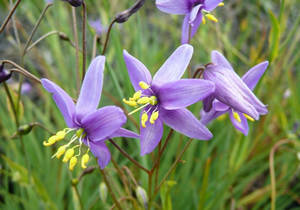 A hardy native lily growing to 80 cm tall - green flax like leaves - bright blue star like flrs with yellow anthers occur in Sp & then develop blue edible berries - frost resistant. 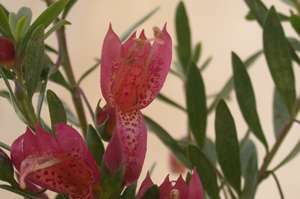 An erect shrub growing up to 2 m tall - linear sticky dark green leaves - pink flrs occur from Wi till Sp - hardy in a range of soil types & tolerant of frost & drought. 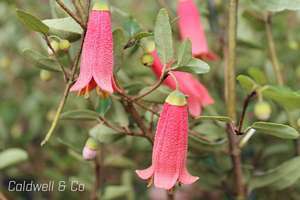 A compact shrub to 1 m tall suitable for hedging - lush green foliage - prolific bright pink flrs for most of the year - tolerant of extended dry periods & frost. 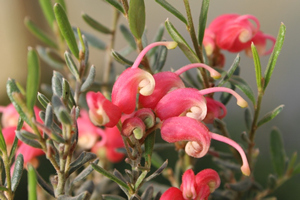 Hardy shrub reaching 1.5 m high - red tubular flrs much of the year - tolerant of drought, frost & heavy soils. 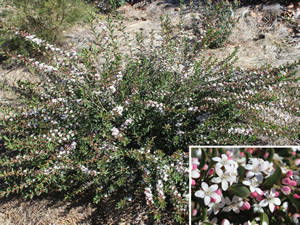 Tar Bush - shrub to 1.5 m tall - very fine greyish foliage with tar like smell - mauve flrs in Sp & Su - frost & drought resistant. 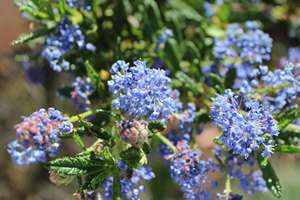 Spreading shrub to 1.5m - narrow, shiny, green leaves - large showy mauve/blue flrs in Sp, Su and Au - tolerant of lime, frost and part shade. 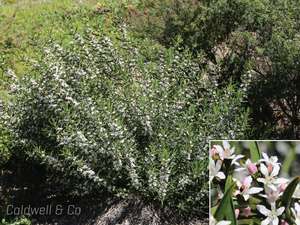 Small Leaf Emu Bush - rounded bushy shrub growing 1 m x 1 m - tiny grey green leaves - small tubular lilac flrs in Su - tolerates heavy alkaline soil, frost & drought. 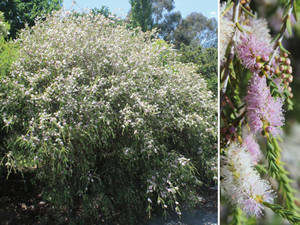 Chinchilla White Gum - Stately white trunked tree to 25m - smooth weeping branches - wh. flrs in Su - excellent timber - suited to poorly drained soils - ideal for avenues - frost resistant. 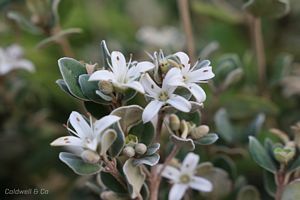 Silver Mountain Gum - Small shrubby tree to 4m - round silver foliage suitable for floral work - ribbony white bark - clay and frost tolerant. 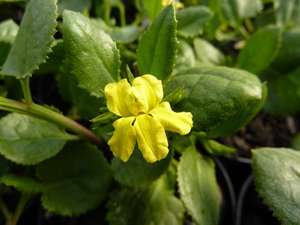 Cut-leaf Goodenia - small rosette forming perennial to 40 cm high - green lobed leaves joined at the base - yellow flrs appear on stems above the foliage from Wi till Su - frost resistant. 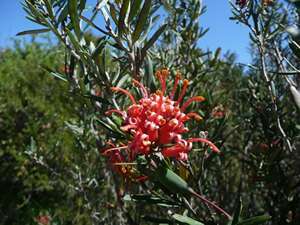 Shrub to 4 m - glossy green holly like leaves - bright red tubular flrs in Sp - requires shade & an absence of frost. 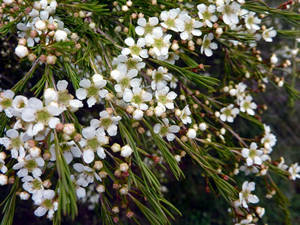 Shrub to 2 m high - small green oval leaves - apricot flr clusters in Sp - frost resistant - tolerant of heavier soils. 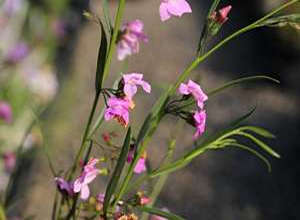 Fast growing dense shrub to 2m - bright green leaves - prolific apricot spider flrs in Wi and Sp - usually frost resistant. 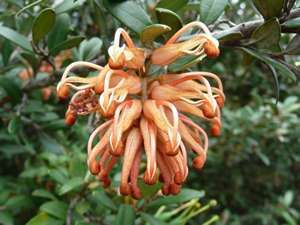 Shrub to 2 m similar to G. Poorinda Constance, however the orange / red flrs are more terminal - frost resistant. 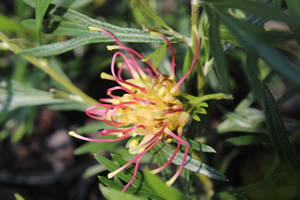 Ground covering shrub to 1.5 m high x 2 m wide - small green pointed leaves - yellow spider flowers in Sp & Su - frost resistant. 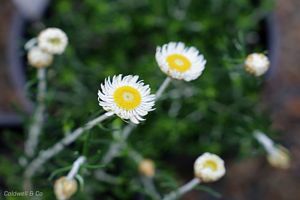 Fast growing shrub to 3 m - fine grey green foliage similar to G. Winparra Gold - yellow spider flrs in Sp - relatively tolerant of alkaline soils - frost resistant. 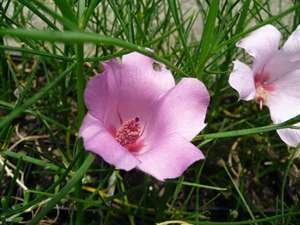 Hardy and vigorous spreading shub growing to 2m tall - green oval leaves - pale pink spider flrs - frost hardy. 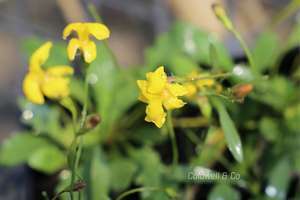 Hardy groundcover - prickly dark green linear leaves - buff yellow spider flrs in Sp and Au - frost resistant. 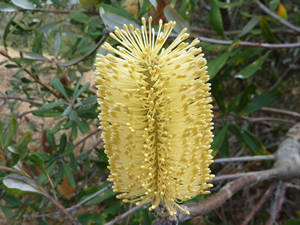 A spreading shrub reaching 0.3 m high x 1.5 m wide - soft narrow leaves - greenish yellow flrs in Sp - frost resistant. 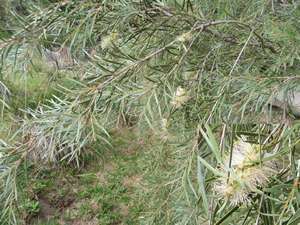 Vigorous shrub to 2 m tall - oval grey /green leaves similar to Grev. victoriae - pink flrs in Sp - frost resistant. 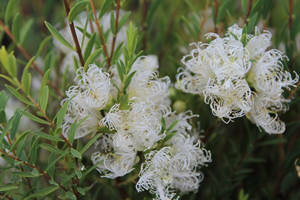 Shrub to 1 m - small soft linear grey green leaves - pale pink and cream flr clusters in Wi and Sp - frost resistant. 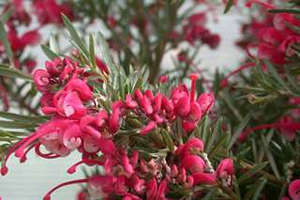 Shrub to 1.5 m high - small linear green leaves - reddish pink flrs from Wi to Sp - tolerant of frost & semi shade. 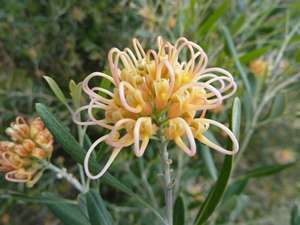 The first recorded grevillea hybrid, growing to 2m tall - soft fine foliage on arching branches - yellow & pink flrs most of the year - tolerant of moderate frost. 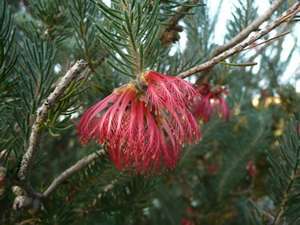 Fast growing hardy hakea reaching 3 m tall - slender arching branches of terete leaves - fragrant yellow flrs in Au & Wi & interesting fruit - frost resistant. 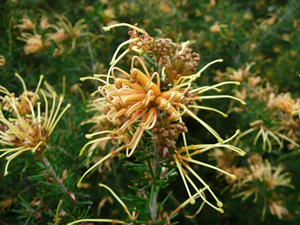 Hardy fast growing large shrub or small tree to 8 m - attractive foliage with reddish growth tips - axillary clusters of white flrs in Sp - useful screening plant or street tree - frost resistant. 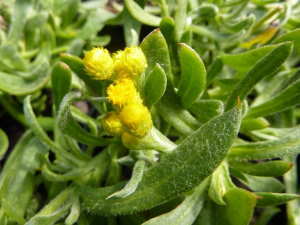 Widespread vigorous sprawling plant - large lush green leaves - showy yellow flrs for most of the year often occurring with the red berries - light frosts only. 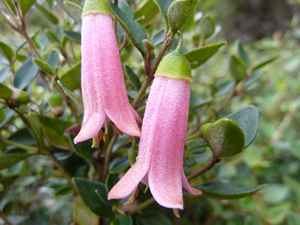 Small upright shrub to 1.5 m - fine aromatic foliage - pinkish purple pompom flrs in Sp and Su - frost hardy. 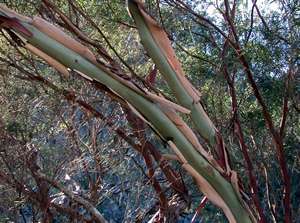 Shrub reaching 4 m tall - silvery green foliage & ornamental green & brown peeling bark - small white flrs in Sp - grows beside watercourses & is frost resistant. 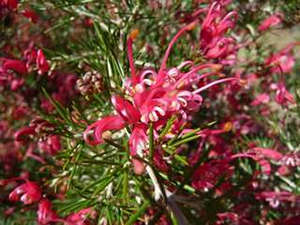 A dwarf weeping tea tree to 1 m tall x 1.5 m wide - fine reddish foliage - masses of red flrs during Sp & Au - frost resistant. 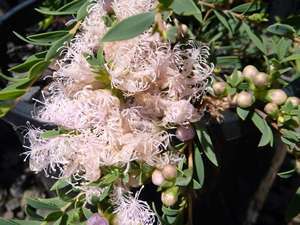 Totem pole honey myrtle - shrub to 3 m - fine weeping greyish foliage - small mauve brushes in Sp & Su - frost resistant. 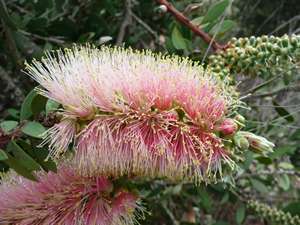 An open erect shrub to 2 m - grey green linear foliage, the new growth having pink stems - large showy gold tipped bright pink brushes in Wi & Sp - moderate frosts only - prefers a moist position. 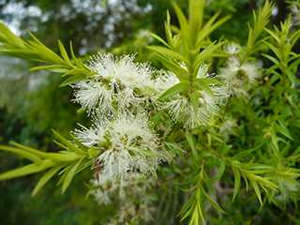 Snow in Summer - Small tree to 10 m - papery bark - fine dense foliage - profuse lacy white flrs in Su - suited to poorly drained sites - frost tender when young. 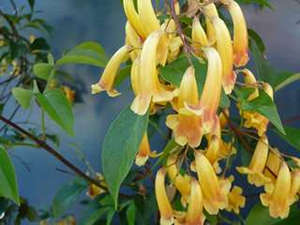 Shrub to 6 m - fine golden foliage with red stems - moderate frosts only. 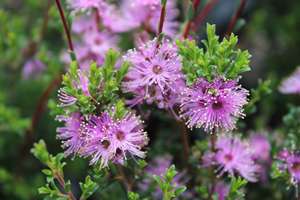 Attractive compact shrub to 50cm high - fine greyish foliage - delicate lacy pink flowers most of the year - frost resistant. 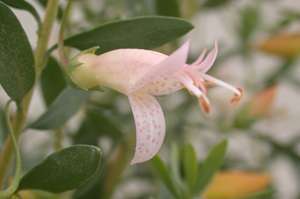 Similar to M. Pink Lace but with white flrs. 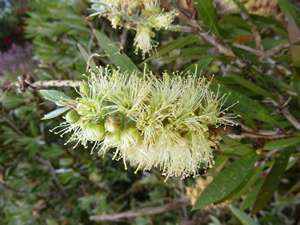 Rare bushy shrub for moist position to 4.5 m high tall - papery bark & attractive grey green foliage - small cream brushes in Sp - endemic to the New England Tableland - frost resistant. 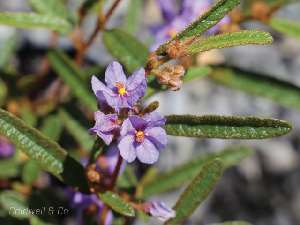 Vigorous shrub similar to the tibouchina - large green furry leaves - purple flrs with yellow stamens are followed by bluish black fruit - frost tender. 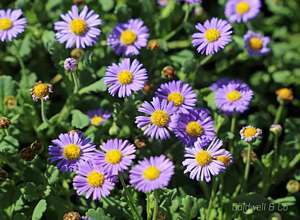 Hardy prostrate groundcover - small fleshy green leaves - pale pink starry flrs - moist position - frost resistant. 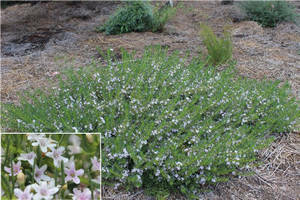 Prostrate groundcover - small fleshy green leaves - pale pink starry flrs - moist position - frost resistant. 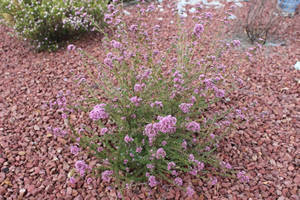 Neat totally flat ground cover - small purplish leaves - white flrs Sp - Su - frost resistant - tolerates wet conditions. 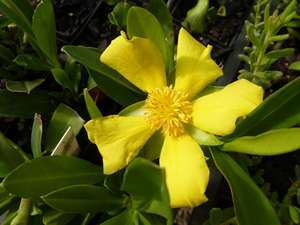 Vigorous climber - green pinnate leaves - tubular yellow flrs in Sp - tolerant of light frosts only. 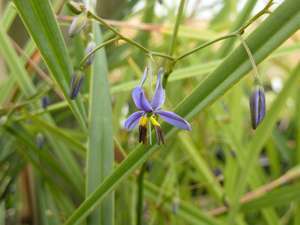 Native Iris - a tufted perennial, the flat green leaves growing to 40 cm tall - purple iris like flrs on stems rising up to 80 cm high - must have good drainage - frost resistant. 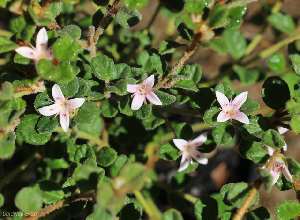 Ground cover - small crinkled glossy green leaves - pale pink starry flrs in Sp - medium frosts only. 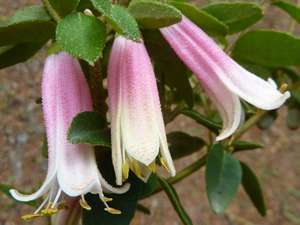 Dainty climber - lime green leaves - pale pink bells during Su followed by blue cylindrical fruit - frost resistant. 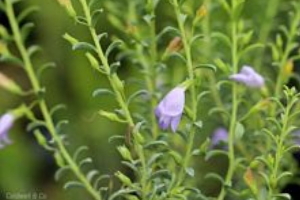 A bushy shrub to 1m - fine greyish foliage � fringed mauve flrs occur in Sp - frost resistant. 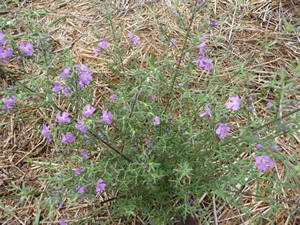 Shrub to 1 m - small linear grey green leaves - bright purple flrs occur throughout the year - frost resistant. 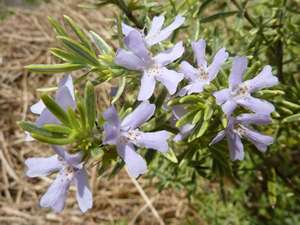 Native Rosemary - Compact shrub to 1.5m - small grey - green leaves - white flrs most of the year - usually frost resistant. 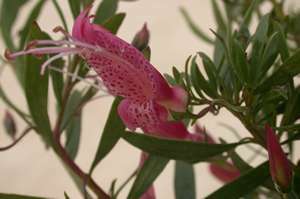 A tough shrub reaching 2 m tall - variegated foliage with a yellow appearance - mauve flrs in Wi & Sp - frost resistant. 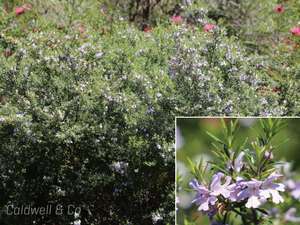 Fast growing shrub to 2 m - fine grey/green foliage - dainty mauve flrs most of the year - tolerates frost. 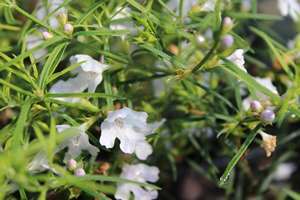 Small compact form of W. fruticosa - grey foliage - white flrs - ideal for hedging - frost resistant. 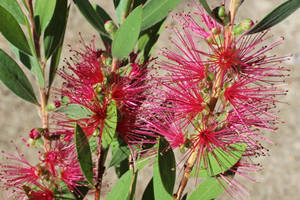 Compact shrub to 3 m - stiff dark green foliage - large crimson brushes in Sp & Au - usually frost resistant. 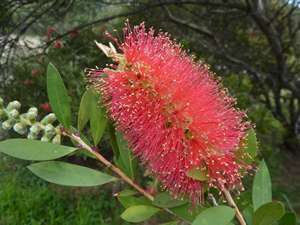 Kingaroy Bottlebrush - A very hardy shrub reaching 5 m high by 3 m wide - pendulous branches of narrow green leaves with purplish new growth - lemon yellow flrs in Sp - frost resistant. 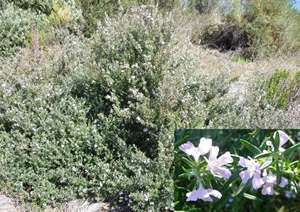 Dense bushy shrub to 4 m - narrow grey green linear leaves - small pale pink brushes fading to cream in Sp - tolerant of frost & water logging. 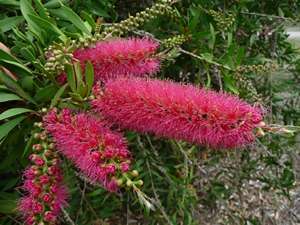 Weeping Bottlebrush - Ornamental tree/shrub to 10 m - pendulous green foliage - red bottlebrushes in Sp - tolerant of heavy soils and frosts. 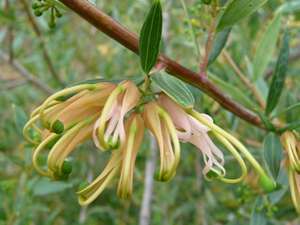 River Oak - fast growing tree to 20 m - dark green needle like foliage - tolerates poorly drained & saline soils - frost resistant. 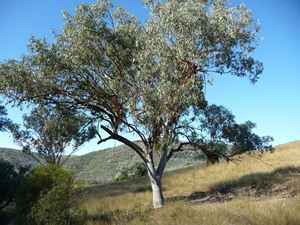 White Box - A hardy farm tree with grey leaves, whitish box bark & cream flrs in Au, durable fencing timber, tolerant of poorly drained, saline and calcareous soils. 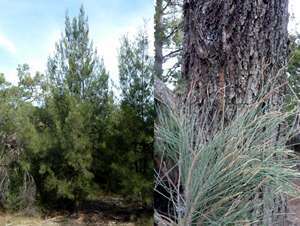 Narrow leaved Ironbark - useful tree to 20m - narrow green foliage - dark furrowed bark - woodlots and windbreaks - tolerates heavy soils - frost resistant. 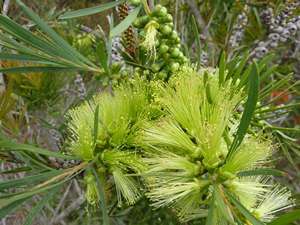 Yellow Box - A hardy all purpose tree to 16 m - rough bark - white flrs in Sp - Su - first class honey tree - useful timber - clay & salt tolerant - frost hardy. 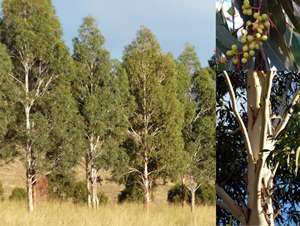 Grey Box - stately farm tree reaching 20 m tall - dark green foliage & a grey tesselated box bark - useful hardwood timber - prefers heavy clay soils - drought & frost resistant. 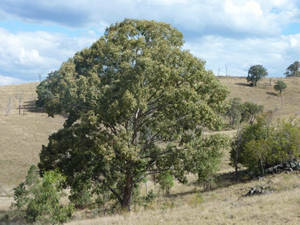 Forest Red Gum - a stately tree to 30 m with a smooth bluish trunk & wh. 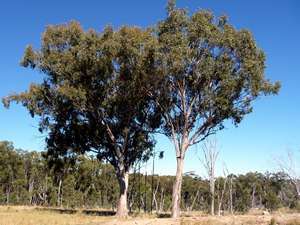 flrs in Wi & Sp - tolerant of frost & poorly drained, saline soils - durable timber - koala tree. Please complete our order form. You are able to preview it before sending.